Basement Brew: Basement Brew is a Minnesota Jam Band with roots in blues, jazz, and rock and roll music. They are a four piece band with two guitars, bass and drums. Alex Gelking (Guitar), Kevin Fowke (Guitar), Nick Spielman (Bass), and John Hanson (Drums). The Confused Brothers Band: Luke & Chad Hofland and Lucas Geraci have been striving to play more music for years. Join them on their journey to bring music back to priority one. Wavy Maze: Wavy Maze is a Minneapolis-based rock and roll four piece that came together in the summer of 2014. Drawing from their eclectic musical inspirations and backgrounds, they strive to create original sounds that infuse influences from hip-hop to dance music to psychedelic rock to good old fashioned rock and roll. Little Fevers is a sweet and crunchy amalgamation of pop rock that has formed, much like a pearl, over many years around a tiny grain of sand. Invoking the playfulness of bands like Pavement and the Violent Femmes, and vocal textures of idols such as Peter Gabriel and The Microphones to form something all their own, Little Fevers released their debut album, Field Trip, on October 9, 2015. Kim Shattuck formed the Muffs with bassist Ronnie Barnett, drummer Criss, the Muffs were picked up by Warner Bros and subsequently released their powerful eponymous debut album in 1993. Shortly after, Crass left the group and was replaced temporarily by drummer Jim Laspesa for the tour. The Muffs released their 6th studio album, Whoop Dee Doo, in July 2014 via Burger Records/Cherry Red Records. Jake Jones was set to release his first full-length album, From Time to Time, in July 2016. The 10-song album highlights Jake’s willingness to expose his life in a candid, passionate way that is wholly relatable and, at times, hauntingly captivating. Drawing inspiration from Tom Petty, Willie Nelson, Sturgill Simpson, and Jason Isbell, From Time to Time takes listeners on a 39-minute journey through life’s rawest emotions. Wilkinson James is Liz Wilkinson and AJ Scheiber. A mix of Appalachian roots and edgy singer-songwriter vibe, with a dose of blues. 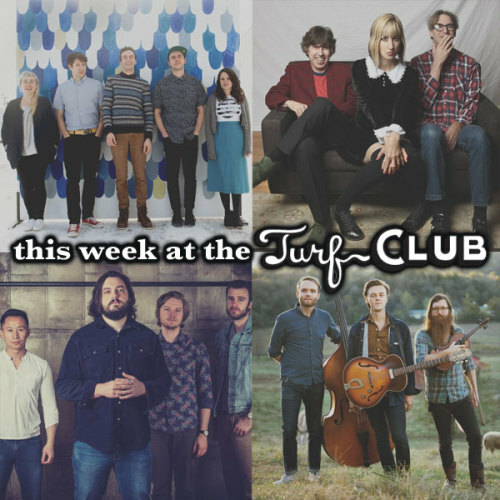 The Turf Club opens for Sunday brunch at 10:00am, music starts at 11:00am. His new album, The Very Last Day, (Okrahoma Records/Thirty Tigers) proves an ideal vehicle for Millsap’s message, delivered via gospel-tinged rock-and-roll poetry. As Millsap sings his stories about lonesomeness and longing, the supernatural and the ordinary, even the saddest portraits become loving odes to everyday humanity.